Humphrey Shivamba from The Law Society giving advice on housing issues. CJN identifies an important theme through our media work that needs addressing (like domestic violence, citizenship or access to legal representation). Actively helps people with their legal matters through consultation with lawyers. Connects stakeholders (like Legal-Aid, Pro Bono and Seri) together with our offices and radio stations. Gives helpful speeches and room for engagement. Opportunities to refer cases to relevant partners. We then interview the people who attended the event to produce more, in-depth stories around these issues. Thandeka* has a baby strapped to her back and is waiting in a queue outside The Orange Farm Human Rights Advice Centre. The kid is a cute ball, but whimpering slightly as the wind and poor weather knocks it about the head. Thandeka is 26-years- old and a South African citizen, but was never issued with a birth certificate and has never managed to receive a green ID book. She says this has heavily impacted her chance of getting a job and when she visits home affairs (as she has regularly for the last ten years) it has got to a point where they simply laugh at her and send her home. Thandeka is waiting to be seen by a representative of Lawyers For Human Rights. 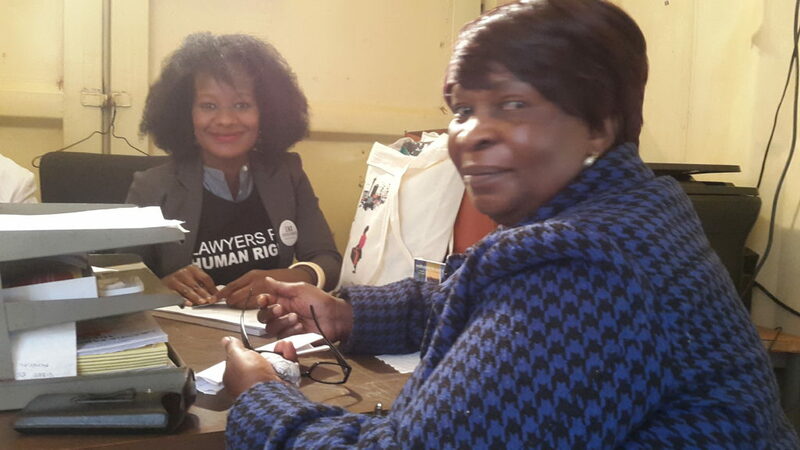 Lawyers For Human Rights is one of the many organizations that are in Orange Farm to help at a workshop organized by Bricks Mokolo, Head Paralegal and Activist at the Advice Centre, and a long-standing partner of The Citizen Justice Network (CJN). Orange Farm is about 50km outside of Johannesburg just off the Golden Highway. The workshop is addressing citizenship rights and housing problems and has attracted around 200 people from the surrounding areas (there was interest from masses more, but it was necessary for people to make an appointment to keep the numbers at a manageable level). Because of this ‘appointment system’ Bricks’s phone has not stopped ringing all morning. So people like Thandeka are here to sort out ID paperwork and there is also a strong theme around statelessness at the workshop. This is an issue CJN has been tracking and building stories around during this year in Orange Farm and our other territories like Musina (on the border with Zimbabwe). Most people have arrived with armfuls of personal papers, looking for legal and government help. In relation to housing there are strong concerns around illegal evictions and title deeds. The advice office has a warehouse section at the back and there are soon several snaking queues of people to see representatives from ProBono.org, The Law Society, Legal Resources Centre, The Department of Housing, The Department of Rural Development and Land Reform and The Master of The High Court (which today is focusing on “deceased estates” where people are trying to extract housing and wealth after someone has passed on). When I go to speak to the snappily dressed Humphrey Shivamba from The Law Society. He has pages and pages of the names of people that he has spoken to this morning and has plans to follow up and see more residents in the coming weeks. The large team in the corner from The Department of Rural Development has brought a printer with them and are using it to dish out the exact status of properties (who owns it, when it changed hands and its legal history) on the request of the Orange Farm residents. 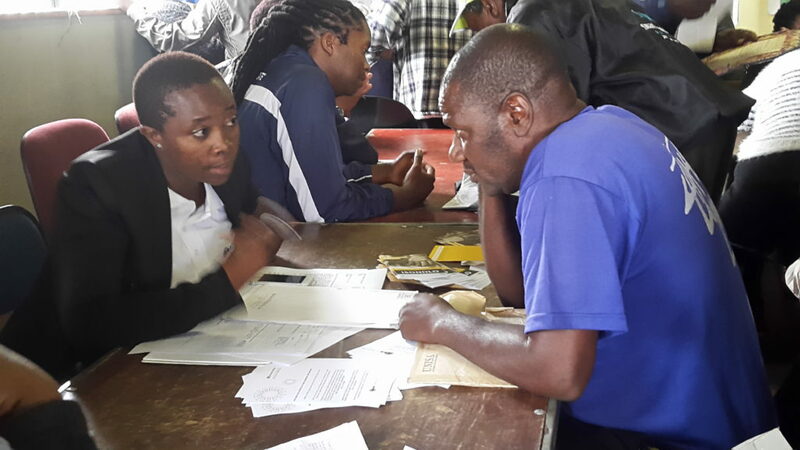 ProBono.org is a two person dynamo, Tshenolo Masha and Romeo Gumede, pumping through dozens and dozens of people over the course of the day addressing matters of title deeds and evictions. The event chose to target the issues of citizenship and housing because they have revealed themselves to be important through the work of Bricks, the advice office and the radio journalism work he has been doing as a partner with CJN. His office has produced radio stories and discussions on housing (most thrilling has been the police’s role in evictions and rights people have) and citizenship. CJN has trained these local activists and helped them produce quality radio and broadcast it on the local community radio station, Thetha FM. The workshop is a huge success in terms of leading people to legal advice and government officials, but also it will complete the circle of community workshops and journalism, as while they are being helped by lawyers we will talk to the people who attend the event to produce more, in-depth stories around these issues. And in turn we will find new issues from the journalism work to build future events. It is a perfect collaboration and a process that can be spun into an infinite range of issues. Bricks stands, clearly happy, in the centre of the productive chaos of the day. Rice and chicken in polystyrene packages is being brought out for the people still waiting to be helped. His team at the advice centre have done incredible work to pull the event together today and it is crucial that they clearly have the trust and support needed from the residents of Orange Farm. Though there is a huge demand for these types of events and this type of legal assistance in rural areas in South Africa, external groups and NGOs often struggle to nurture this trust and so they can stage an event like this and have no one arrive. This is hard to imagine with the enthusiastic crowd around us, but it means more credit needs to be given to people like Bricks (and other advice offices around the country) who have managed to cultivate this trust. They have succeeded because they are genuine in their aim to help people. At first glance it looks like it is Bricks who needs these organizations, but when you see how the people around him hang on his every word it is organizations like ProBono and us – I include CJN in this category – who need the advice offices and people like Bricks so we can get close to the people who will benefit from what we are offering. Our funding relies on reaching and helping these people that would not be accessible without the advice offices. It is a symbiotic relationship that should be recognized and should propel us to grow the offices stronger across the country. 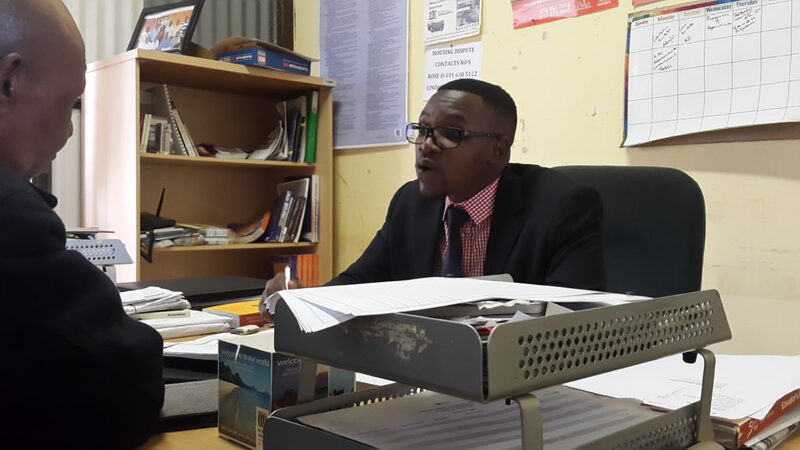 The workshop was held at The Orange Farm Human Rights Advice Centre on Wednesday the 6 th of April 2016.